DC Dog Mom’s own Daisy was lost to an inoperable and untreatable form of cancer in her spine. 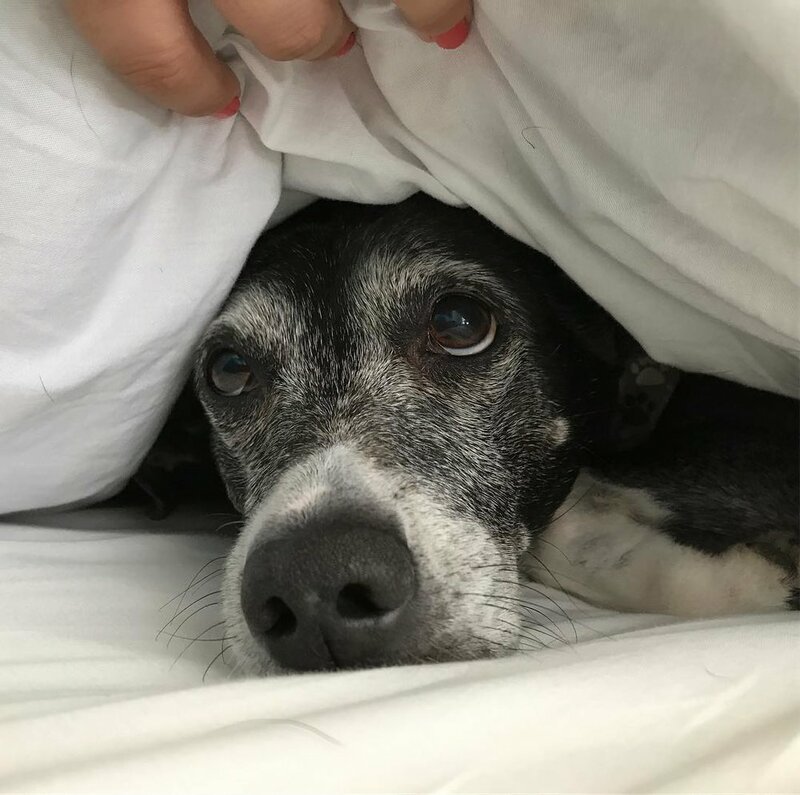 When we first shared news of Daisy's diagnosis on the DC Dog Moms Instagram account, I was struck by the number of people who reached out to say they, too, were dealing with their dog's cancer. While every diagnosis is different, there are a number of commonalities in how each dog parent is approaching treatment. We’re sharing them below in the hopes that they will help you approach this difficult situation. This is, of course, the first course of action for any pet owner dealing with cancer. Start with your trusted vet and ask for recommendations. In the DMV area there are a number of options for specialized vets. VCA Southpaws in Fairfax, VA can not only provide advanced diagnoses but also an extensive array of treatments from surgery to chemotherapy. Daisy was treated there and the care was exceptional. Although we have no direct experience with Friendship Animal Hospital’s oncology department, the DC Dog Moms community has shared a lot of positive feedback. There are a handful of potential treatments for the cancer itself, including surgery, chemotherapy, and radiation. Beyond treating the cancer, there are options for managing the symptoms it creates. Your vet will recommend a course of action but the decision is yours to make. Ask a lot of questions about each potential treatment and take notes. Take your time to decide. Get a second opinion if you want more professional advice. How will the treatment itself affect my dog? How severe are the side effects? Are there ways to manage the side effects of treatment? How successful is this treatment on average? If this treatment is successful, how much longer is my dog likely to have? Will it prolong her life by a few months? A year? A few years? Is that prolonged life worth the side effects of the treatment? How much pain is my dog in? What will her quality of life be if this is treated in this way? That last question may seem heartless but it isn’t. Your job is to provide the best possible life for your dog and going into severe debt may hinder your ability to do that. If the cancer is untreatable or if the available interventions will ultimately detract from your dog’s overall quality of life, you can still help your dog with palliative care. This care focuses not on healing, but on managing symptoms. Because Daisy’s cancer was untreatable, we relied exclusively on palliative care from our vets. For Daisy, that meant a variety of painkillers as well as medicine to minimize stomach trouble from the painkillers. Daily assessments of quality of life are one of the best things you an do for your dog. Again—TAKE NOTES. In a daily journal, note how much medicine your dog took each day and what time. Note his energy, his indications of pain, and any other symptoms you notice. If you prefer a digital journal Journey Pets allows you to rate a number of key factors. Another common measure is the HHHHHMM scale: Hurt, Hunger, Hydration, Hygiene, Happiness, Mobility, and More Good Days than Bad. If you notice the quality deteriorating ask for more medicine or different medicine. You can also find services to manage pain like acupuncture. You can provide palliative care yourself by considering modifications to make your dog’s life easier. Pet steps let them climb on to your couch when you’re away if they can no longer jump. Homemade recipes provide delicious comfort food. A wagon lets your dog enjoy the outdoors or a short walk in their favorite park without making them walk all the way there. Acupuncture for Pets is a service that provides treatments in and around Arlington and DC. You need your friends and family to help you care for your dog. If you don’t have a car, ask to borrow one. If you do have a car, ask a friend to drive you to treatments in case you are too emotional to drive safely. Ask friends to come over and sit with your dog while you run errands. Ask friends to go to the park with you. If you feel uncomfortable asking for help, remember that you are doing your friends a favor in return. People want to help when they see a friend in pain. They feel better for having something practical to do. What’s more, your friends probably love your dog. You are giving them valuable time with your pet which benefits everybody. Now is the time to spoil your dog more than ever. What are her favorite things to do? What don’t you let her do normally? It is incredibly hard to be present and joyful with your dog when you are worried about his treatment or dreading his loss. This may prove to be your biggest challenge. In my last weeks with Daisy I found that two things helped with this. First, having friends come spend time with us so I could see the joy Daisy still had through someone else’s eyes. Second, remembering that Daisy had no idea what was happening but that she was sensitive to my feelings. My sadness was impacting her so I tried to put it aside when possible so she could enjoy her normal silly and cuddly time with me. You can also stay present by taking time each day to tell your dog, out loud, all the reasons you love him. You can say, “I love your tiny paws, I love your wet nose, I love how you chase balls, I love how you hate baths, I love how you protect me by barking at the doorbell,” etc. While you do this, pet your dog and give him your full attention. Also know that anticipatory grief is a real thing and it can be just as hard, if not harder, than grief after a loss. Allowing yourself this grief and talking to others about it will help both you and your dog. Let your dog sample all the human food he wants—burgers are a favorite! When Daisy was sick I googled this topic relentlessly. I couldn’t bear making the decision too soon or too late. I felt hopeless when websites or people would say, “you’ll just know.” I didn’t want platitudes—I wanted answers. Unfortunately, no one else can give you this answer. I wish I could give you that, but all I can do here is share my personal experience in the hopes that it helps you consider an approach that works for you. First, I turned to Dr. Karen Randall of Solace Veterinary Services. Daisy was getting palliative care from VCA Southpaws but Karen helped guide me through quality of life considerations in addition to that treatment. She has a professional, subscription-only scale she provides that helps rate your dog’s current level of comfort. Second, I chose my own criteria. I knew if it were up to me I’d keep Daisy with me for every moment I could. So I made a conscious choice to take my own wishes out of the equation. I decided I never wanted Daisy to have a day that was more bad than good. Daisy loved her life and I wanted that to be true to her last breath. Third, I decided on a plan. Allowing Daisy to stay in her home until the end was a priority for me. Karen will come to your home to put your dog down. She administers morphine first so your dog drifts off to sleep, and then she administers the final medicine. This may not be the right plan for you, but having one will help so you aren’t making decisions like this when you’re in a crisis. Fourth, I decided how I wanted to memorialize Daisy. This might seem like a strange thing to plan but it helped me consider the ways in which she would stay with me once she was gone, and that in turn helped me approach the decision to put her down with a little less fear. Consider what will work best for you. I chose not to have Daisy’s ashes returned to me. My thought was that those wouldn’t be my Daisy and they wouldn’t make me feel like she was still with me. Frankly, I regretted it in the first few days of grieving but ultimately I believe it was the right choice for me. Instead of an urn, I had a print made of her paw. I collected her favorite toys, the collars that reminded me most of her, and some other personal keepsakes and put them into a memory box. Recently, I added the sympathy cards I received. I collected some of her hair and put it in a hollow bracelet that I wear frequently. I also planted flowers for her (daisies, naturally) at my mother’s house since I don’t have a yard of my own. A perennial plant will remind you of your dog season after season. Fifth, I reviewed my quality of life notes every day. When I was caught up in anxiety and uncertainty I consulted Karen. And sixth, I decided. When Daisy reached a point where I no longer believed her pain was controlled I made the decision. I agonized over it until nearly the last moment. I considered telling Karen not to come. When Karen did come I delayed for more than an hour. It was one of the most difficult decisions I’ve ever made. But I can tell you this: Karen administered the morphine and Daisy fell into a gentle sleep. She snored for the first time in two months and I realized she had been in too much pain to sleep deeply enough to snore. That was when I “just knew.” I let Daisy go and almost instantly I felt I had done the right thing at the right time. For me it was immediate and peaceful and it made the loss slightly more bearable. So all I can say is that while you may not be sure it’s the right time beforehand, you will find peace with that afterwards. I would like to note once more that these strategies worked for me and for other members of our community but this process is so personal that you have to consider what works for you. There are NO WRONG CHOICES here as long as you keep your dog’s best interests at heart. Remember that this is all part of giving your dog a beautiful life filled with love and affection and, just as in everything else, your dog believes in and trusts your decisions. Please don’t hesitate to reach out if you are going through this.